Bathtubs are awesome, and the presence of a great one can turn your regular weekend getaway into the most fancy of affairs. Here’s seven of our country’s finest to sink into on your next trip. BYO rose petals. Hamilton Island’s luxury resort qualia is what summer dreams are made of. ‘Qualia’ is latin for ‘a collection of deeper sensory experiences’ which is a total ‘nail, meet head’ situation. 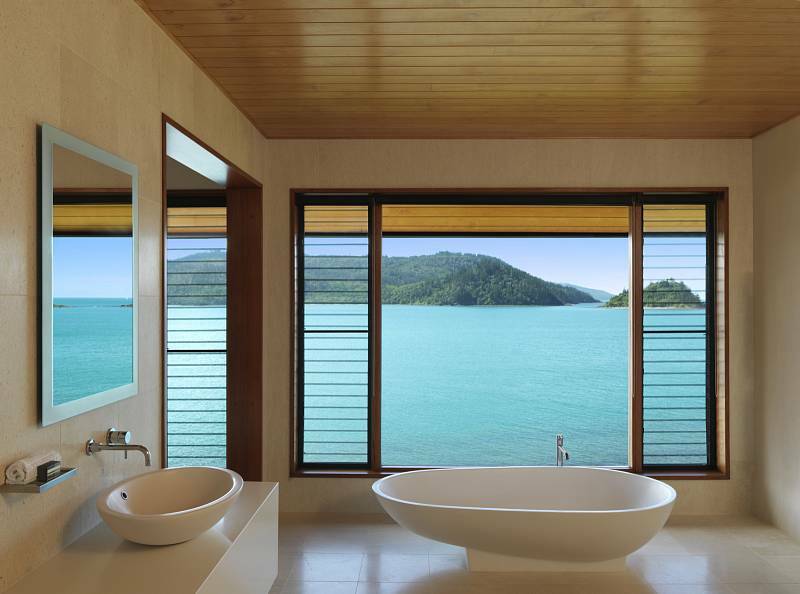 qualia is so fine that this it’s been voted Australia’s best resort, and the accompanying views from that lush tub are just the cherry on top of an already excellent experience. Ever wanted to be bare nekkid in front of a bear? If so, you should know that’s a very dangerous desire and you should abandon it at once. Unless you are at Canberra Zoo. 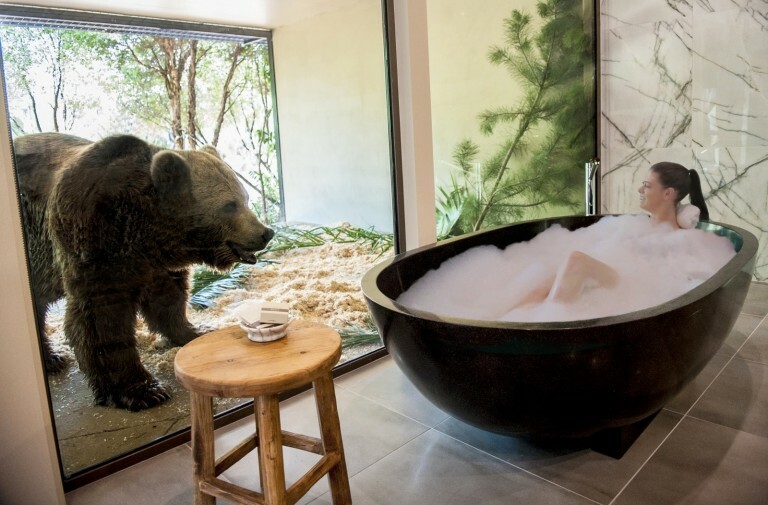 There, in the Jamala Wildlife Lodge, you can take a bath beside a bear with nothing but a (very strong) pane of glass between you. Their Jungle Bungalows are situated inside the lion, cheetah and bear enclosures, so you can have a bath time stare off with a fierce natural predator. It’s, um, relaxing. We swear. 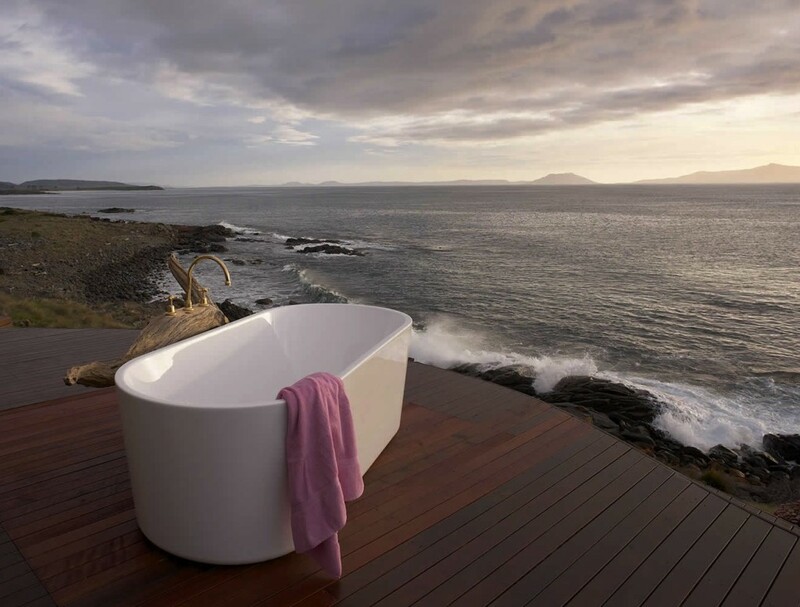 At Thalia Haven in Tassie’s Great Oyster Bay, you’re going to get a little more than acquainted with nature – you’re going to positively embrace it, especially in this bathtub with views to the end of the earth. Sure, exposing yourself to the rugged Tasmanian coastline might seem a little brash, but when your neighbours are a whole bunch of trees and the Tasman Sea, there’s nothing to be ashamed of. If someone told you to point to the middle of the state of Queensland, you’d probably end up somewhere close to Longreach. This town has a deep love for the Outback way of life, so you’re in for something pretty special when you settle in at Kinnon & Co Homestead Stables. With rooms modelled after the stables and the stable-boys’ quarters on a traditional Outback station, the pièce de résistance has to be what’s out back (get it?) – an incredible outdoor terrace with one sweet looking backyard tub. 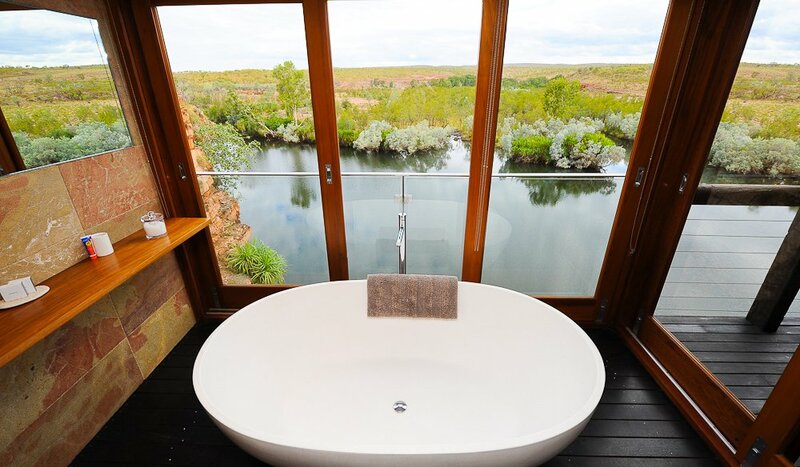 Found deep within the rugged Kimberley region of Western Australia, the El Questro Homestead is a stark contrast to the untamed natural beauty that surrounds it. 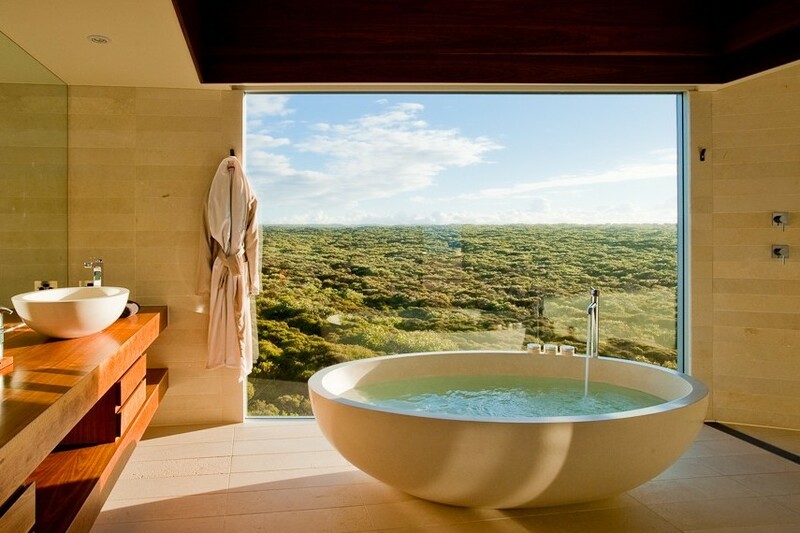 Their indoor tub is the picture of perfection – it’s paradise in the wild, with a killer view to boot. We’re going to stay forever. 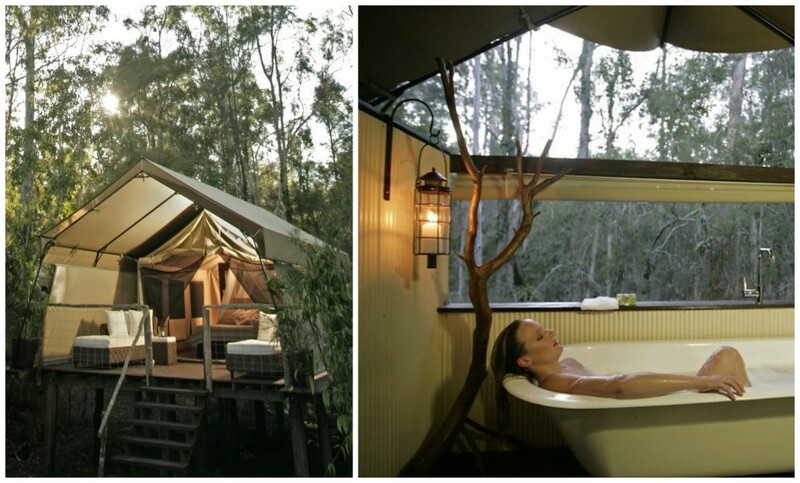 Situated on a beautiful plot of bushland in Jervis Bay, fronting right onto a creek, Paperbark Camp is a luxury safari-style eco-resort. And with deluxe tents that easily lull you into a relaxing stupor with their cosy in-house tubs, we reckon it’s safe to say that glamping never looked this good. Ugh, how is this even real? Located on Kangaroo Island, just a short ferry ride over from Adelaide, the Southern Ocean Lodge is luxury at its finest. Found on a clifftop overlooking kilometres of untouched beaches, there’s views of the Southern Ocean on one side, and the green wilderness of the island on the other. Bliss. 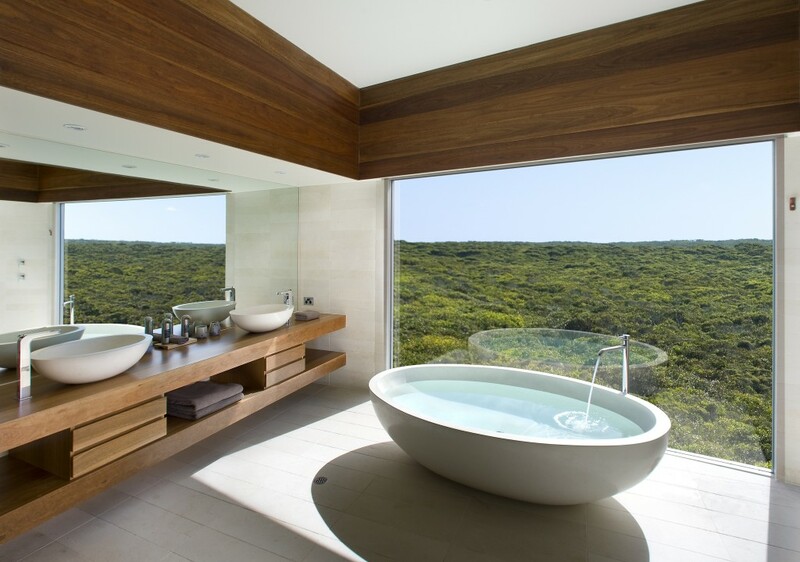 Start planning your bathtub-centric adventure with Qantas.